The straight and curved headjoint options allow players to use the correct headjoint for optimum comfort while playing. The Armstrong headjoint cut offers players crisp response and a rich, warm tone. Pointed key arms add elegance and style. The straight and curved headjoint options allow players to use the correct headjoint for optimum comfort while playing. The Armstrong headjoint cut offers players crisp response and a rich, warm tone. Pointed key arms add elegance and style. The 703 "Heritage" Alto flute offers the quality and dependability that players come to expect from the Armstrong name. 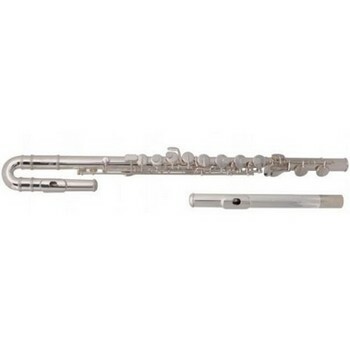 Silver plated straight and curved headjoints, silver plated body, silver plated mechanism, pointed key arms, C foot, french style case with cover.